In general, I sympathize to an extent, but the pictured and quoted resident gets no sympathy from me. According to his resume (available online), he just graduated college in 2010, so he hasn't been here for very long. 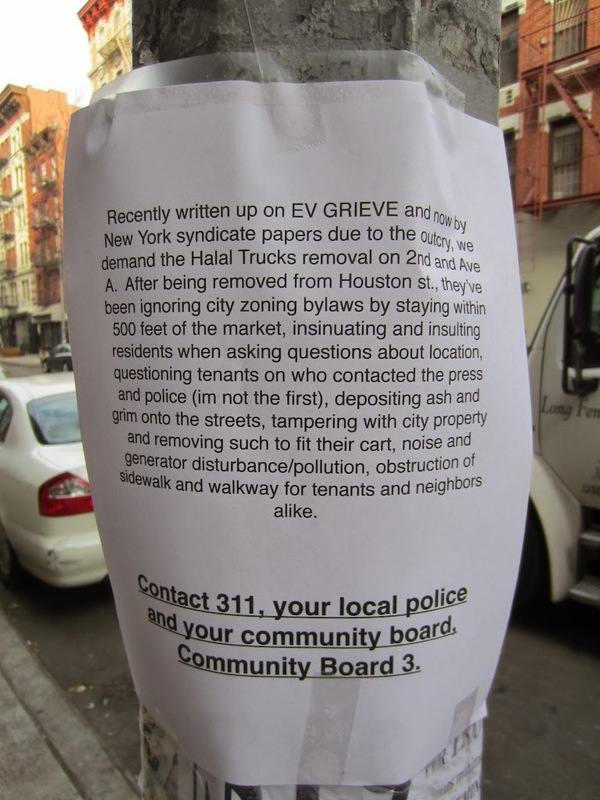 I'm sorry, but if you've moved to Avenue A in the last couple of years, you don't get to complain about noise and street vendors. Oh, but the resident is right about the shittiest bar on earth on the corner. Not 2A, which is across the street, but the Chase bank branch, which is RIGHT WHERE THE FOOD CART IS and it's the shittiest bar on earth, or would be it if were a bar. @Anon 9:21 - I would normally agree, but he graduated from SVA which is in Manhattan. He could have lived here his whole life. And those carts don't need to be on such a residential corner. The taco guys on 2nd and A are in a good spot, for example, and they're not as messy. They're nice, and respectful. Carts like this are mostly for the drunk idiots. 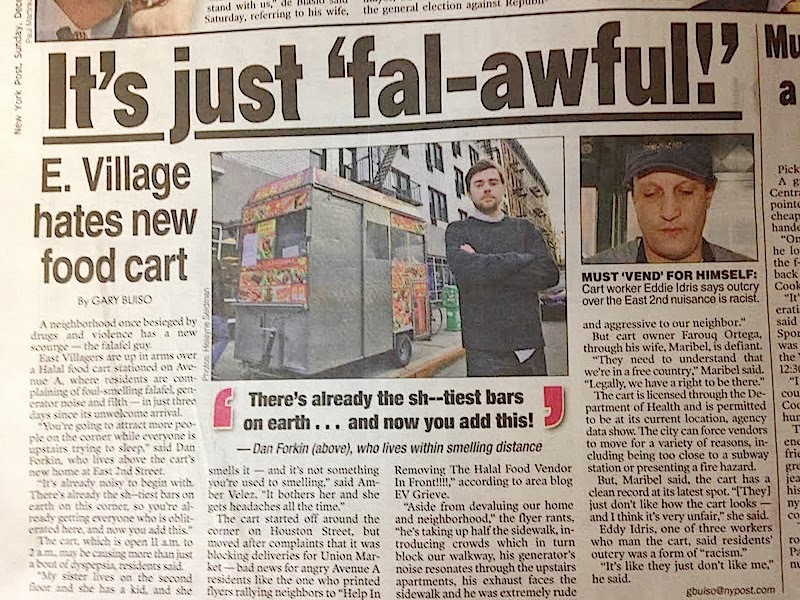 I love the food carts but maybe this is not the best place for one. Can he move across the street near the Mexican one that's been there for years? It's just a big wall there, so smoke/exhaust doesn't blow into apartments. honestly tired of these transplant yuppies that try to bend the city's ways. 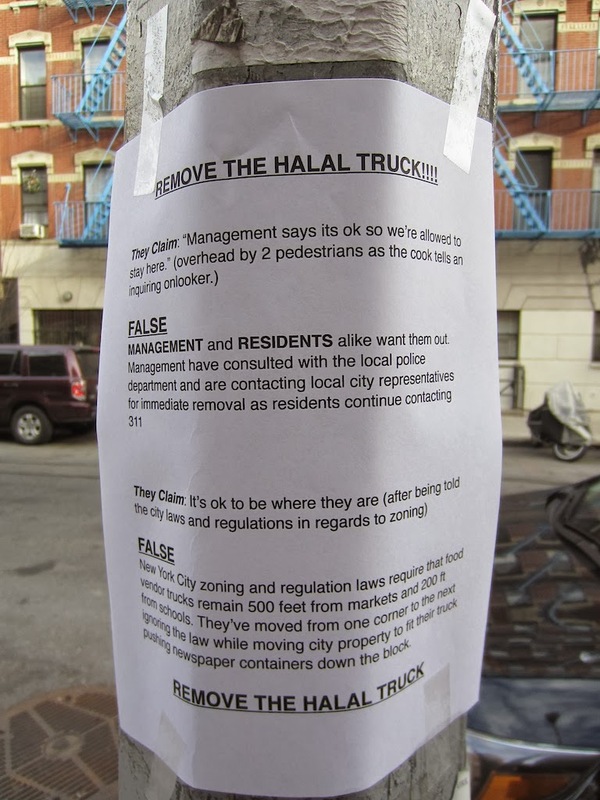 i'm for the halal guy who's just trying to hustle and probably lives in the real New York aka Queens. Um, has no one thought to call NYPD ? IF it's illegal then he should get fined & forced to move. We need more bars like 2A in the neighborhood and fewer uptight yuppies like the guy complaining. 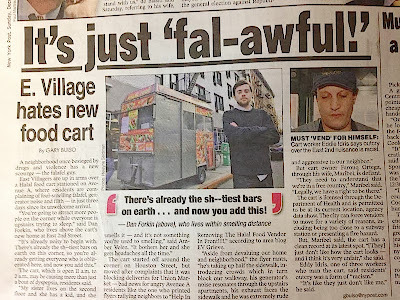 I worked as a food cart vendor in NYC when I was high school and college. not only can be a thankless job, you are a prime target for end of the month ticket/citation quota filling from the NYPD. Anything form a torn license to being 1 inch off the official site. And then the cart gets impounded and more fines happen. So, if this guy is in an illegal place, then he probably would have been fined already. That being said, not all vendors are friendly, happy or even collegial. Some of the guys working could be pretty rude to the tenants. And to call this kid formm the article a "yuppie." I know it's our first base assumption. (He certinaly looks entitled), but he is an SVA grad. Many of my roommates over the years were SVA students and grads. My sister went there, too. As cool as it may sound as a job, it's not like creating stuff for ad agencies is a goldmine financially. He's probably making not a lot to design this stuff at his computer, which is probably right up from this cart. This isn't being handled well, but I'm not taking either side here. No one's the innocent person. If he has his vendors permit and all that in order, then all these uptight yuppies and hipsters that transplanted into the area just need to get over it or move back to ohio or wherever they're from. NYU is also in Manhattan. Are you really saying that all the NYU kids in the neighborhood "could have lived here [their] whole life"? He has every right to be here, but anybody who knowingly moved to Ave A in the last couple of years and is complaining about the noise / street food, gets no sympathy from me. 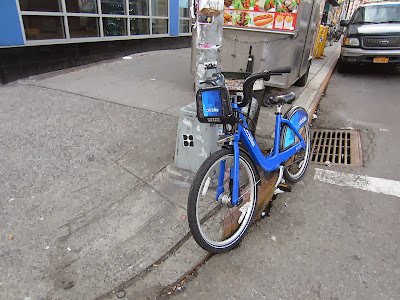 There are things we all dislike about the neighborhood, but if you're (fairly) new here, you knew where you were moving. I've been here about 10 years now and live near that corner. I've noticed the new truck a few times, though nothing necessarily bothered me about it. However, I'd understand if the fumes were in front of someone's window and they had to smell / breathe that all day. It seems more elitist to me for a well-off (rents at 20 Ave A are in mid-2000s) kid from Ohio to interfere with a low-skilled immigrant's right to make a living. Nothing is worse than "ash and grim"! This is nothing but a pathetic and annoying crying baby who somehow thought when moving to Avenue A that they would l be living exactly as they did back in the suburbs. What a mean and spiteful little horror! I would hate to be living next to them, because once they displace this poor food truck guy, they will develop a new obsessive psychosis and anyone within a 200 foot circumference who even dares too flush a toilette too loudly will be the target of new flyers on ever corner of 10009. Try going to Cleveland or Altoona or Sheboygan or Peoria or Urbana or Pittsfield or wherever most of these imports come from and just try telling the locals you don't like the way they do things around there, that their kids and cows and nanny goats and pickup trucks and country music are just too loud for your tender ears. Then tell them how that smell belching from the Denny's or Cracker Barrel or '76 Truck Stop or Bob's Big Boy or the Waffle House is interrupting your concentration. I'll bet a dollar for every IQ point these geniuses have stored inside their cute little heads that they will burn your house down, eat your pets, and then chase you out of town faster than the Halal guy can make a felafel sandwich with hot sauce to go. I have been living here 15 years and that is a bad spot for that guy. 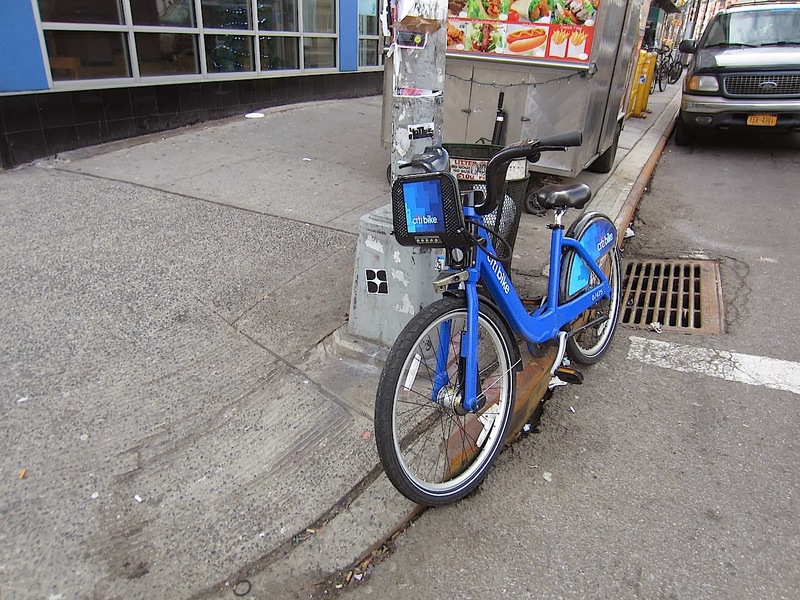 There are plenty of spaces within a few blocks that would be better suited. He should just move! you grew up there,then you know what's happening. "Maribel said. “Legally, we have a right to be there — we’re not bothering anyone." - Uh, the lady said they're not bothering anyone so obviously they're not bothering anyone. Quit yer' bitchin'. The money line is all the way at the end of the Post article: "The cart is licensed through the Department of Health and is permitted to be at its current location, agency data show."